Baltimore Mayor Catherine Pugh stepped down Monday from the University of Maryland Medical System’s Board of Directors after she was criticized for failing to disclose a business deal she had with the hospital, The Baltimore Sun reported. 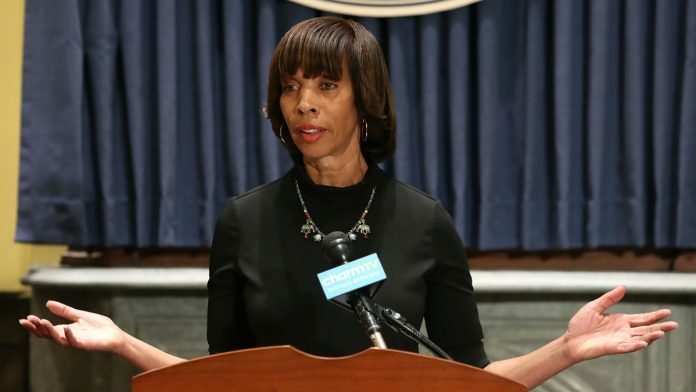 Pugh came under fire for failing to divulge a book deal she had with the hospital system, worth $500,000 and dating back to 2011, according to The Sun. The network, which is comprised of 11 hospitals, reportedly spent $500,000 to buy 100,000 copies of Pugh’s self-published “Healthy Holly” children’s books in 2011, 2013, 2015, 2017 and 2018, several city and hospital officials told The Sun. Stephen A. Burch, chairman of the hospital system’s Board of Directors, accepted Pugh’s resignation on Monday and thanked her for her service. Pugh is by far the only board member with longstanding business contracts with the hospital system. The Sun, in a review of these contracts, found that at least nine of the network’s board of directors had business deals with the system for goods and services, each valued at hundreds of thousands of dollars. The contracts ranged from consulting to pest control services. Since news of the business deal became public, Pugh amended seven years of financial disclosure forms filed with the state ethics commission. In the amended documents, Pugh discloses that her company, Healthy Holly LLC, sold children’s books she authored and self-published to the medical system. Maryland lawmakers are calling for an audit of the medical system.